In the sunflower family. Seeds, roots, and young shoots edible. Roasted root is coffee substitute. 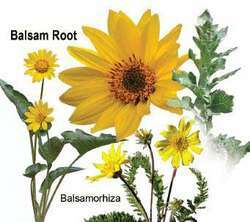 Related variations- Hairy Balsam Root (Balsamorhiza hookeri) Hoary Balsam Root (Balsamorhiza incana) Arrowleaf Balsam Root (Balsamorhiza sagittata) Used for stomach, bladder, female, colds, rheumatism, dysentery. Heading east, you'll see balsam root and groundsel on Dog and Wind mountains near Home Valley, and camas and lupines between Bingen and Lyle. Balsam root, penstemons, and a host of other flowers can also be found.